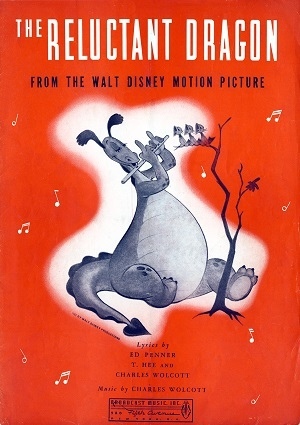 The Reluctant Dragon starts with a father rushing into his soon and telling him that there is a monster in the village. Curious about it, the kid goes and finds out that the monster is a dragon, although not the kind of dragon you would imagine, as it is shy and loves poetry. Eventually, they become friends and when they find out that a dragon slayer, Sir Giles, has come to the village to slain the dragon, the decide to stop that from happening. It turns out that both the dragon and Sir Giles love poetry, so they become friends and decide to fake a fight so the village can see that the dragon is no harm.